Twin Palms is a family oriented community in South Palm Springs originally developed by the Alexander Construction Company in 1957. Palmer & Krisel are a couple of architects who worked with the company to design and construct more than 2,500 homes in Palm Springs. They established a distinct modernist style that was imitated throughout the rest of the country, and is much appreciated by architecture admirers today. Twin Palms mostly features these Mid-Century homes with their soaring butterfly and pitched roof lines. Other quality homes were added to the neighborhood later as infill by area builders and some of the original Alexander homes have undergone restoration back to their original state. Residents of Twin Palms have the luxury of having the Smoke Tree Village Shopping Center in very close proximity, with its large grocery store, drug store and several wonderful small restaurants. Hiking trails, horseback riding and golfing are also found nearby for lovers of the out of doors. 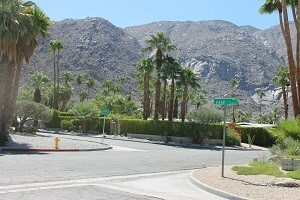 Twin Palms is ideally situated close to downtown Palm Springs, the shops on El Paseo and the Palm Springs International Airport. Entertainment for all ages can be found close by, including fine dining, cultural museums, art galleries, boutique shops and a wealth of indoor and outdoor activities. Twin Palms also has easy and convenient access to the Interstate 10 freeway and Highway 111, which leads to all the other Desert Cities. Many of the homes in Twin Palms are located on large lots in family-friendly cul-de-sacs, making for a charming small town atmosphere. These spacious homes typically have 2 to 4 bedrooms with 2 to 3 baths. They range in size from approx. 1,300 sf to approx. 2,900 sf. There are also condominiums available in this scenic neighborhood. This iconic neighborhood features a selection of the popular Alexander homes designed by William Krisel in the Mid-Century Modern style. They are one of the most sought after styles of homes in the California real estate market. These rectangular designed floor plans offer open and spacious floor plans with butterfly, folded plate and low-gabled roofs.